Ina does it again with her recipe. I did adapt it a bit by adding some additional vegetables and omitting a few ingredients in the assembly of the dish. But overall, the key part of this recipe is the flavor that comes out when roasting vegetables. There's a slight smokiness that really adds a depth of flavor from roasting diced eggplant, bell peppers, mushrooms and onions... but yet, a subtle sweetness comes through since these vegetables are roasted until caramelized. These vegetables are then tossed with perfectly cooked orzo pasta and dressed with a simple dressing of olive oil, lemon juice, salt and pepper. To finish off the dish, I added some black olives, freshly diced tomatoes, a sprinkling of Italian parsley for color and crumbled feta cheese for a bit of salty tang. For the dressing, combine the lemon juice, olive oil, salt, and pepper and pour on the pasta and vegetables. Let cool to room temperature, then garnish with olives, tomatoes, parsley and feta cheese. Check the seasonings, and serve at room temperature. yum! this is one of my favorite Ina dishes and oftentimes i make just the veggies and vinaigrette with feta as a side. looks great!! 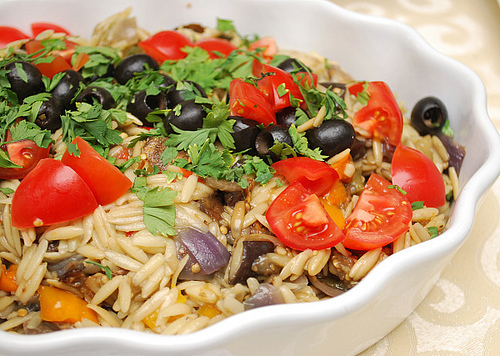 Orzo goes so well with veggies. Great recipe. Made this for our family dinner last night- DELICIOUS!!! 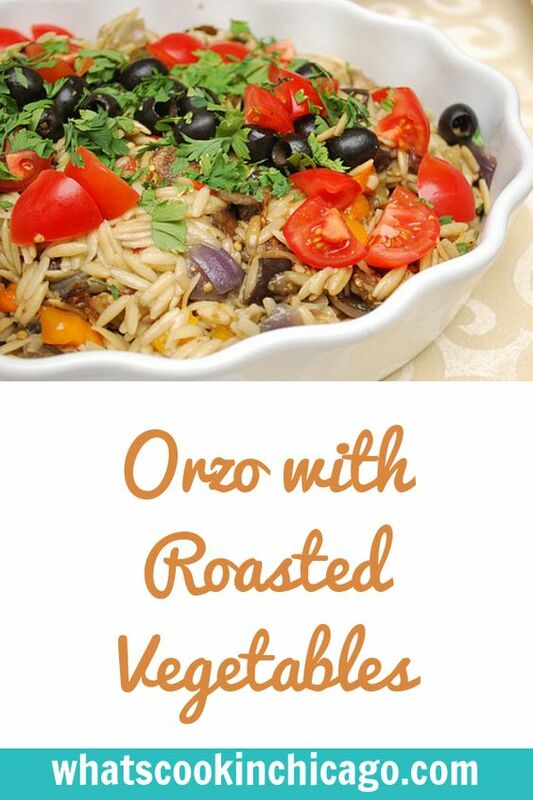 I love the deep flavors of the roasted veggies with the light, crisp flavors of the tomatoes. Perfect. Will definitely make this over and over.